Likutim Yekarim, anthology of Chassidic essays from the founders of Chassidism, R. Yisrael Baal Shem Tov, and his disciples: R. Dov Ber Maggid of Mezeritch, R. Menachem Mendel of Premishlan and R. Yechiel Michel Maggid of Zlotchov. Lemberg (Lviv): R. Shlomo Yarish Rappoport, . First edition. The title page bears the stamp of Rebbe Yechezkel Paneth Rabbi of Deyzh (Dej), author of Knesset Yechezkel: "Yechezkel Paneth Rabbi of Deyzh and the region". 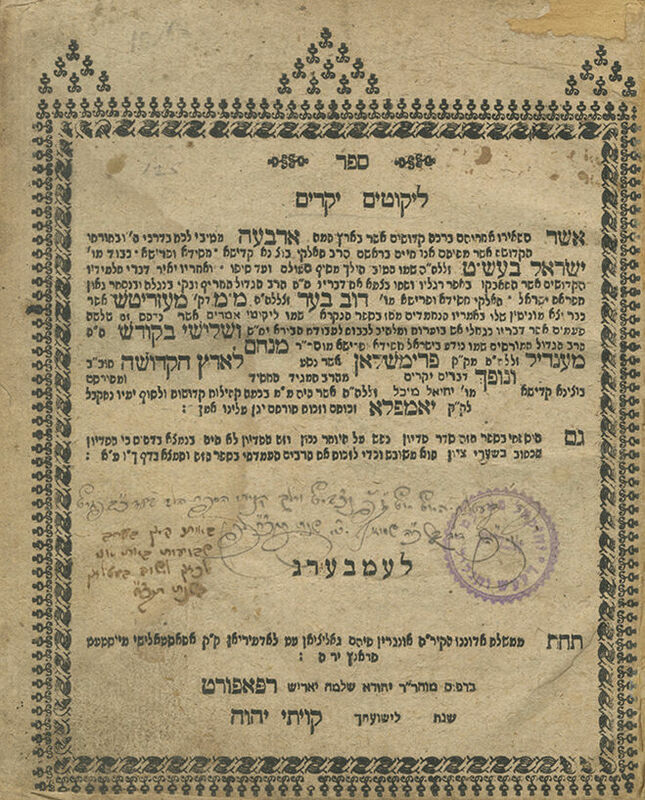 Early ownership inscriptions dated 1832 on the title page: "Here Betlan (Beclean), today, Tuesday of Parashat Nitzavim Vayelech, I purchased this book for 22… I, David son of R. Shmuel, 1832". Another inscription by the same writer (different ink color): "That year on Shavuot eve, I came here to the town and settlement of Betlan in 1832". Rebbe Yechezkel Paneth, rabbi of Deyzh (1869-1929), grandson and disciple of the Maaglei Tzedek, Rebbe of Deyzh. He was a foremost, pious Hungarian rabbi in his generation. After his wedding, his travelled frequently to the Divrei Yechezkel, Rebbe of Shinova, who revered him and drew him close. He served as rabbi of Urișor and Marosújvár (Ocna Mureș), and in 1903, succeeded his father in Deyzh. He was a wonder-worker, who brought about salvations with the power of his prayers, and "thousands of Jewish people were saved through his holy prayers, including some cases which had no natural solution, only through a miracle, and all was effected through his exceptional holiness and holy prayers" (Kol Bochim, Deyzh, 1930, p. 9). His book Knesset Yechezkel on the Torah was published after his passing (Cluj Napoca, 1931). , 40 leaves. 21 cm. Good-fair condition. Dampstains. Wear. Worming. Tears to title page (repaired with paper). Tears to leaves 31, 39, 40, affecting text (professionally restored, with text replacement). New leather binding. The printing press of R. Shlomo Yarish Rappoport also notably published the holy book Noam Elimelech in 1788, and its workers were reputedly holy men of the 36 hidden righteous people of the generation (see: R. B. Landau, R. Elimelech MiLizhensk, Jerusalem, 1963, p. 311, who quotes an oral tradition [in the name of R. Moshe Halberstam], on the unique qualities of R. Shlomo Yarish's edition of the Noam Elimelech, which "was printed by G-d fearing workers, who worked in sanctity and purity, and some were of the 36 hidden righteous ones upon whom the world stands").